Between directing Bloodborne and co-directing Dark Souls 3, From Software president Hidetaka Miyazaki has kept busy. As he works on Dark Souls 3's downloadable content, Miyazaki must consider the future of From Software and what’s after Souls. Here’s what the designer had to say. Though Miyazaki is now running From Software, he comes from humble beginnings; he joined the company as a coder and spent time with the Armored Core series. Demon’s Souls, the game that would put him on the map, wasn’t his idea. The project was troubled within From Software and couldn’t find its footing. Miyazaki was assigned to save the game. After Demon’s Souls, there was Dark Souls. The rest is history. My interview with Miyazaki happened over email and, understandably, through a translator. As such, I wasn’t in the position to ask any follow-up questions, so you’ll have to excuse any answers that leave you hanging. Kotaku: How does it feel to be a few months removed from the release of Dark Souls 3, the conclusion of the story started in Dark Souls? Is there relief? Sadness? What have you been doing since it came out? Hidetaka Miyazaki: I’m actually working on the DLC for Dark Souls 3, and have been focusing on a number of new projects. With how busy I’ve been, I really haven’t had much time to feel hollow, so to speak. If anything, I’m actually quite excited with what I’m doing, and this is nothing short of happiness to me as a game developer. Kotaku: It’s been seven years since Demon’s Souls was released. How have you changed as a person in that time, and has that impacted your approach as a game designer? Miyazaki: Just like anyone else, I believe I’ve changed since then. Ever since Demon’s Souls, I’ve been able to experience many things that I couldn’t have imagined experiencing before. Of particular note would be the emotional feedback, both good and bad, from players, and seeing the game’s community grow. These, and all the other valuable experiences spurred me on, and I couldn’t have been any more grateful. In order to repay everyone for what I gained from them, I’m planning on making sure that the changes I go through is something I will take to heart in a constructive manner. Kotaku: Where do you look for inspiration these days? Do you seek other games, movies, or books? Can you tell me about what you’ve been reading/watching/playing lately, and what’s interested you about it? Miyazaki: My sources of inspiration come from various venues. The media you mentioned are sources of inspiration, but if I was to bring one item up in particular, I would say books, especially text-based books. I’ve brought this up before, but my pastime is to imagine and fantasize from reading text-based books. This is one of my inspirational sources towards game development. I know it’s a bit old, but of recent, I found myself enjoying the book, The Paper Menagerie and Other Stories. Personally speaking, it’s quite interesting to see how emotionally invested I am, in a good way, reading the book. Kotaku: I deeply enjoyed playing Dark Souls 3, but it was familiar. This makes sense, of course, because it’s the third Dark Souls game. If you count Demon’s Souls, which was similar in tone and aesthetic, it’s the fourth game. One of the series’ great strengths is its mystery, which is lost in sequels. Was that challenge for you, as a designer? Miyazaki: Dark Souls 3 was designed to be a sequel, so the story, in like manner, is made as a sequel, too. The story for this game is built upon the story of the fire keepers from Dark Souls 1 and 2, and this is where the sense of mystery can be found. I believe this style of storytelling is something unique to sequels, and it was a fresh and joyful experience to be working every moment on it. 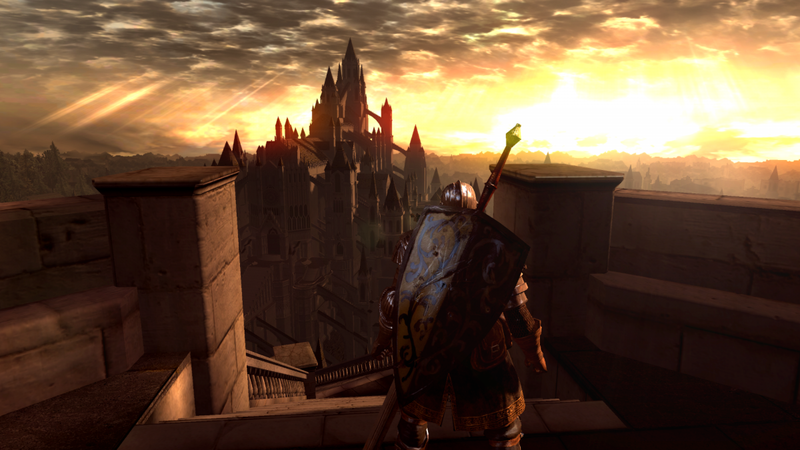 Kotaku: One of the biggest moments in Dark Souls 3 is when players return to Anor Londo. It’s the one time in the series where the player returns to an area they’ve previously been to. How did that idea come about? Kotaku: There are multiple endings for Dark Souls 3, as there are for the previous games. But in your head, is there a single, true ending? Does one of them represent how the world of Dark Souls concluded? Miyazaki: There is an ending that I would personally select, but I can’t say which one is of prominence among the four endings. This is because all the endings, and the game play until then, are a precious part of the story the player experiences. Kotaku: Demon’s Souls was a cult hit, but Dark Souls 3 is a blockbuster being sold to millions. Since then, you’ve become president of From Software, and you have to be concerned about the company making money. Are you concerned that might incentive you to take less risks with future games? Miyazaki: No. It’s actually the opposite. If we avoided risks, we wouldn’t have positioned this game to be a turning point in the series and an end to the current storyline. I believe the new projects we will be announcing will show our stance and direction we’re headed to. Kotaku: Players don’t always know what they want. Often, they don’t know what they want until you show it to them. How much do you weigh the demands of players against what you think is the right decision? Miyazaki: I don’t think I get everything right with my decisions, but I do have faith in the decisions I make based on the visions I hold. In order to make my vision come to reality, I place importance in various feedback including those coming from test players. The reason why I have faith is because I like games, and because I’m creating games to those who like games. Kotaku: When people think of Hidetaka Miyazaki right now, they think of Souls. Even Bloodborne is deeply tied to the design of the Souls games. 10 years from now, would you be okay with that? Or are you determined to make games wildly different from Souls? Miyazaki: To be honest, I’m really not interested on how I’m viewed as. The only thing I’m interested in is to keep creating something special. Whether that something is synonymous to me or not is really none of my concern. But, I can’t deny the fact that the Souls series is something special to me, so I am happy to know that people have that sort of image of me. Even if that image stays with me, I have no intention of ending in a way where I couldn’t create a game that surpasses the Souls series. That would be pretty sad, wouldn’t it? I have no intention of ending in a way where I couldn’t create a game that surpasses the Souls series. That would be pretty sad, wouldn’t it? Kotaku: I wanted to ask about your process for approaching a new game, whether it’s a sequel or a brand-new world. Where do you start? Can you remember what you were doing when you came up with the concepts for Bloodborne, for example? I’m hoping you can walk us through one of those moments. Miyazaki: Mmm... That’s a tough one to answer. For Bloodborne I don’t really remember what led up to my vision of the game [laughs]. If anything, my vision of a game is something that is formed, honed, and polished by working with those around me, especially with the great folks on the development team. This, to me, is something integral to the way I develop games, and the game so created is, without doubt, “our” game. Kotaku: For people who have already finished Dark Souls 3, can you give any tease for the DLC? How do you intend to surprise players? Miyazaki: I’m not sure I can provide “information” without spilling the “surprise” [laughs]. The only thing I can say now is that we’re planning two DLCs for Dark Souls 3. The first is scheduled for release in autumn of 2016, and the second is scheduled for early 2017. We’re actually still working on the first one. Content-wise, it builds off of the previous titles and will be featuring a new area, enemies, gear, and story. The game story revolves around a new location which I believe will offer a different feel from Dark Souls 3. Please stay tuned!